← “One Wheelchair, No Fridge” AdVennTuring. Where does a trip start? With the idea, with the planning, or with the first step. 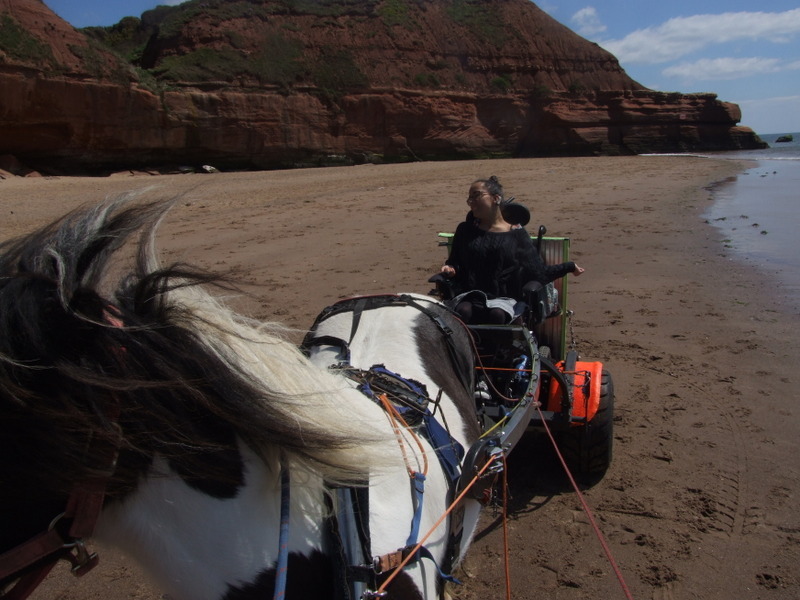 I have chosen Nadia’s trip along Exmouth Beach, from the Harbour View Cafe, to Orcombe Point as the start point of One Wheelchair, No Fridge, #OWNF. Nadia was visiting the West Country from her Yorkshire home and jumped at the chance of a trip on the beach, something she hadn’t been able to do for years. And this defines the end of the #OWNF journey. It won’t end at a geographical location, but when people realise that all terrain wheelchair access is easy. Nadia hasn’t been on a beach for years. She was on the beach within ten minutes of meeting Obama and I. Nadia uses a wheelchair. So…………… lots of people use wheelchairs. 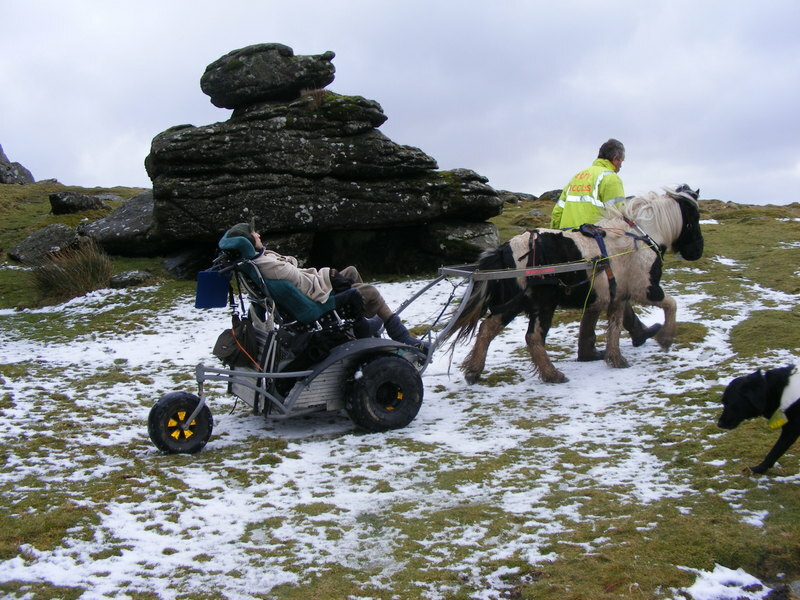 Pony Access can take any person, with any wheelchair, anywhere. 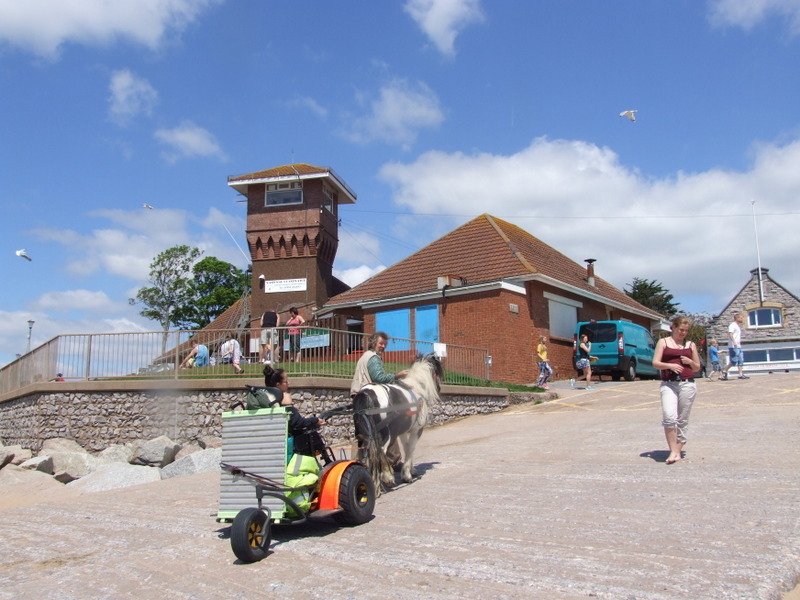 On Tuesday, #OWNF set off, with me driving, in a wheelchair, from the Exmouth Station car park. 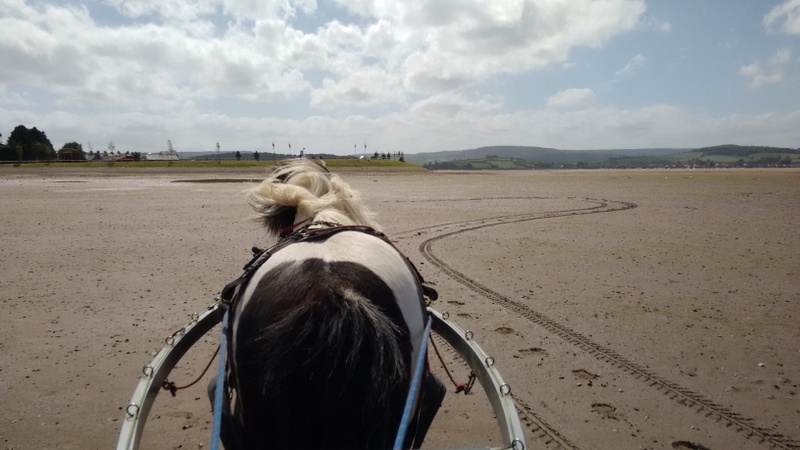 The estuary, sand and creeks and mudflats stretched out on our right, so we mounted the kerb, drove over the sea wall and across the sand and mud and shell to head for Lympstone. After about 300 yards we hit soft mud and Obama was rapidly ankle deep in squelchy stuff, and not enjoying it. I wasn’t any keener so we looped round and headed for the sand bank heading towards Lympstone, but further offshore. This also ended in the squelchy stuff, and with the tide coming in, I wasn’t going to be silly, so less than half a mile into the trip, we have to turn back. Is this a failure? Who cares? Obama and I did a further 7 kms around the Estuary and Exmouth, heading through the marina development to the Harbour View Cafe and then up to Phear Park and back to the Station Car Park. There are lots of routes to Lympstone from Exmouth and across the estuary is, by a massive margin, the least used route. I am sure it is possible, but the only intelligent way to cross estuary mudflats is to stick to the firm stuff, and if you have any doubts, turn back. Alternatively, take a local guide who knows the route. So I failed, but only on one minor issue. 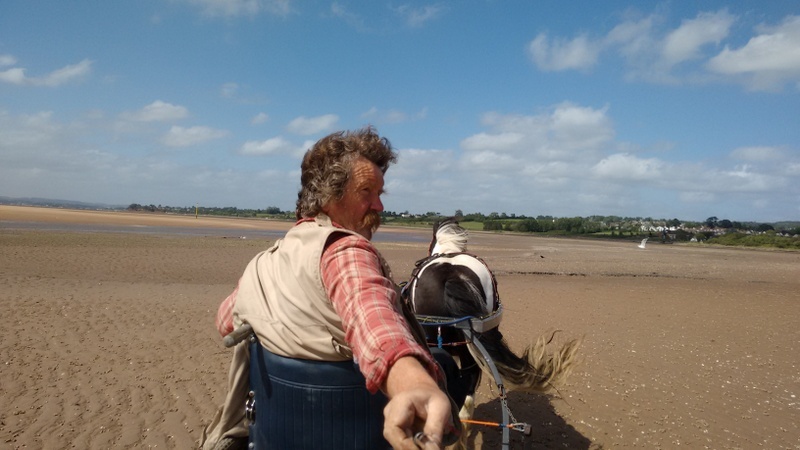 I drove around the estuary, looking at the boats, watching the birds and enjoying the view, crossing soft mud and soft sand, in a wheelchair without effort or risk. 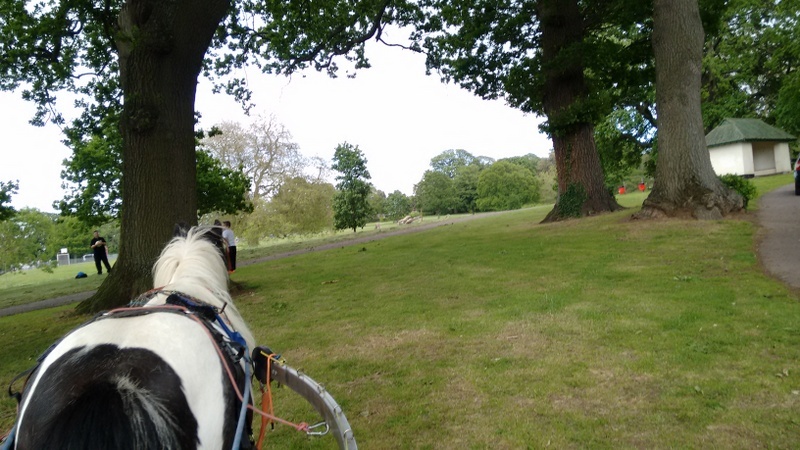 I then cruised through the town to Phear Park where Obama met most of the local dogs, and had a nice relaxing canter. The only problem we faced was meeting the donkeys who provide beach rides, in their paddock. Obama says he is happy to cope with most things, but not donkeys. He froze when he saw them, and started backing up, with the clear intention of spinning round and setting off anywhere that wasn’t towards those ******* donkeys. This why I am the one driving the iBex, from a wheelchair, from Exmouth to Plymouth. Because firstly I know Obama well enough to see signs of distress, instantly. And secondly I can get out of the wheelchair and up to Obama’s head to reassure him, instantly. Safety is a different issue. I can pull the instant release, instantly, from the wheelchair. This produces two massive benefits. The person in the wheelchair is now safe. The iBex brakes apply automatically. It isn’t going anywhere. And secondly, Obama cools down the minute he is out of the vehicle. Under normal conditions, he is indifferent to the vehicle. He has spent long enough in it, that it is just part of normal life, but when he is stressed and scared, the vehicle restricts his free movement. If you want to increase stress, restrain an animal that relies on flight for safety. So safety is based on the Saddlechariot instant release, which works regardless of which animal is pulling, and regardless of which person is in the vehicle. But when Obama saw the donkeys, he was stressed and upset, and needed to be reassured and persuaded that they weren’t a threat. One arm over his shoulders, and one arm feeding him treats and he was at least prepared to stand still. On a busy road, at rush hour, I felt this wasn’t the best place to spend time introducing Obama to the idea that donkeys are harmless, so we crossed the road, and carried on on our way. 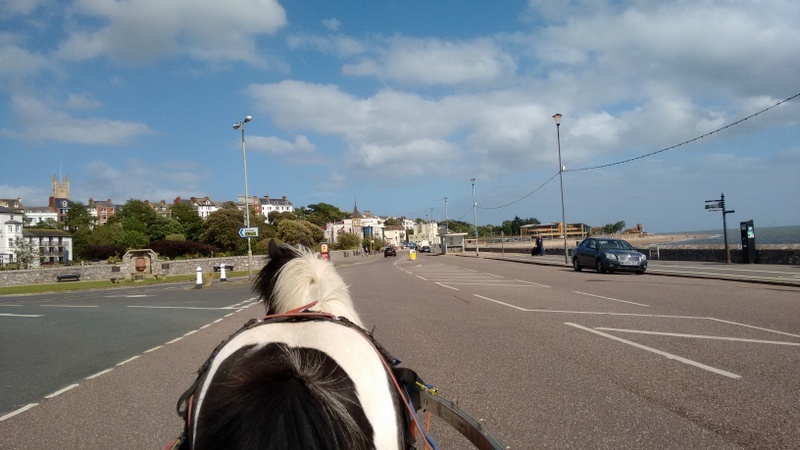 At the end of the session, I had driven in a wheelchair around a lot of Exmouth, and from the station to the marina across the estuary without any problems, and I only got out of the wheelchair a couple of times. I am not going to risk Obama by trying to prove I can do everything in the wheelchair. That isn’t the point of the trip. I want to show that we can cope with the terrain, or at least any terrain that an intelligent person would wish to traverse. I have failed to cross to Lympstone because I don’t know the safe route, if there is one, and I don’t know that either, across the estuary. No intelligent person would want to cross the estuary in those conditions, so #OWNF is still on course to succeed. The end of the trip could be anywhere, because the end of #OWNF is not a location, it is when the public are aware that people in wheelchairs can go anywhere they want.